With environmentalists failing to hold back destructive activities in us national parks, musicians have decided to take on the crusade. Rock stars Alanis Morissette, Mike Diamond and Rob Morrow, along with Rick Rubin, have raised objections against the heedless drilling for oil and gas endorsed by a fraudulent bureaucracy. In a letter posted on Morissette's website (www.alanismorissette.com), the artists claim that deputy secretary of the interior, J Steven Griles, is failing to properly oversee havens of biodiversity like the Yellowstone and Yosemite national parks, and the Grand Canyon. "He has been leading the efforts to drill for oil and gas, and has been working to weaken the laws that protect the air," the letter reads. 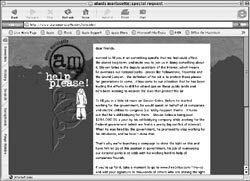 It urges people to sign a petition demanding the dismissal of Griles, which is available at www.firegriles.com -- a site and movement spearheaded by organisations like the Greenpeace and Americans for Energy Freedom. As per the artists, prior to joining the federal government, Griles was a lobbyist for oil, gas and coal companies. The letter claims that he is still being "paid us $284,000 per year by an old lobbying company...and this is a pretty big conflict of interest." "His job of overseeing the national parks is at odds with his working hard to help oil companies flourish," the letter continues. Mark Pfeifle, spokesperson for the department of the interior, describes the comments of Morissette and others "as discarded talking points from partisan special-interest groups". Pfeifle claims that while Griles did serve as a lobbyist for oil companies and electric utilities, he also supported the nation's largest renewable energy company, Caithness Energy. The us $284,000 payment, Pfeifle says, was approved by the government ethics office, that too in a bipartisan manner. "It's fairly standard when somebody gives up his or her practice that they receive payment for it."